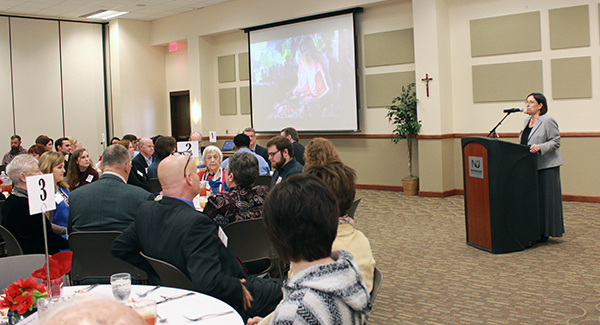 Almost 130 Newman University scholarship donors, student scholarship recipients and guests gathered in the Dugan-Gorges Conference Center on the Newman campus Monday, April 3 for the 2017 Scholarship Luncheon. 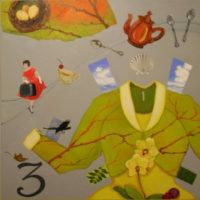 The annual event is designed to give scholarship recipients and their respective scholarship donors an opportunity to meet, enjoy lunch and get to know each other. 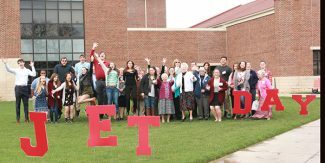 Scholarship recipients and donors join together to celebrate Joyful Jet Day. The event featured a “Welcome Runway” of signs spelling out “Joyful Jet Day,” that lined the sidewalk leading to the conference center to welcome donors and guests to the luncheon. Once inside, attendees were greeted by Newman Senior Development Officer David Alexander, who acted as emcee for the luncheon. The event also featured remarks by Newman President Noreen M. Carrocci, Ph.D., a benediction by former Newman President Tarcisia Roths, ASC, a song by Newman student Taylor Rose, comments by Newman Director of Financial Aid Myra Pfannenstiel, and remarks by scholarship recipients Luke Sponsel and Angela de Souza. 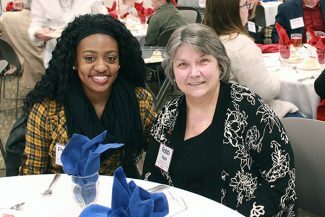 As in previous years, the Scholarship Luncheon was held on Tuition Stop Day, also known as Joyful Jet Day. The day marks the point in the semester when tuition paid by students stops covering the cost of their education, and the remainder is funded by scholarships made possible by Newman donors, which include alumni, parents, friends, faculty, staff, organizations and many others. 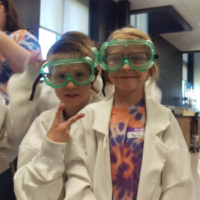 In addition to providing a way for Newman officials and students to thank donors for their generosity, the day is meant to help students understand the significant role donors play in giving students the opportunity to attend Newman and focus on their studies at no cost or reduced cost. Joyful Jet Day also featured treats and photo booths for students, and thank you cards signed by students to be mailed to donors. L to R: Student Gabriella Rizzi, President Noreen M. Carrocci, Ph.D., and scholarship sponsor Mickey Armstrong. As noted by Pfannenstiel at the luncheon, a little more than $30 million in grants, scholarships and other aid passed through the Newman Financial Aid Office to students last year. Of that, almost $15 million came directly from donors in the form of scholarships. 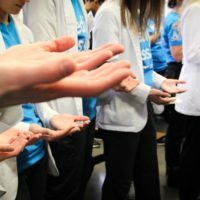 “Your gifts make the sisters’ (Adorers of the Blood of Christ) mission possible, by helping as many students as possible come to Newman,” she said. Students Sponsel and de Souza also thanked the donors for their support. Student Angela de Souza speaks to the luncheon about her scholarship. 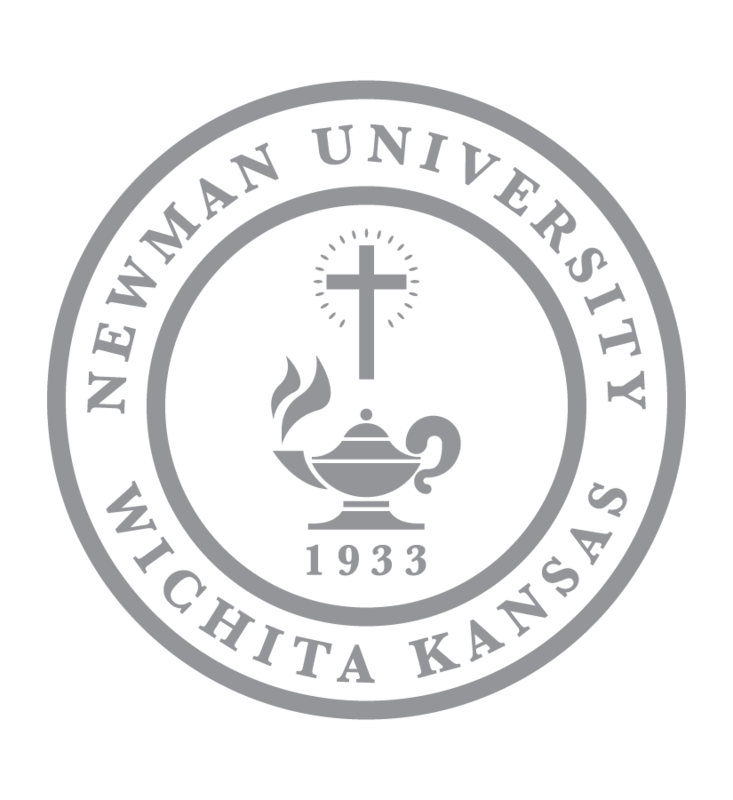 First generation college student de Souza said she looked at every college in Kansas that offered a nursing program before choosing Newman. She said she selected Newman partly because of the financial support, but also because Newman is committed to service and volunteerism. De Souza has volunteered the past six years at Via Christi, and has now been offered a job there. She has also volunteered hundreds of hours at the Lord’s Diner and other organizations. “Thank you for giving me the opportunity to grow in all ways as a person,” she said. 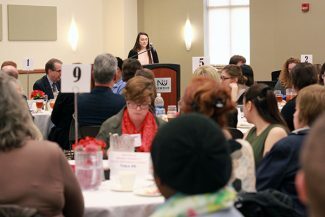 Other donors and recipients at the luncheon noted similar sentiments of gratitude, such as Cardinal Newman Scholarship recipient Emily Sarnacki. 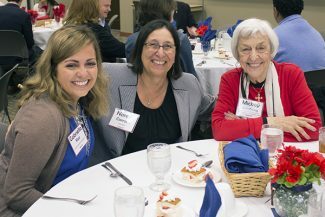 Fran Schumer, ASC, who along with others representing the Adorers at the luncheon, said she is continually impressed by Newman and its students. Attorney Linda Kirby, mother of a Newman graduate who said she helps promote donations to Newman to clients drawing up wills and trusts, agreed that Newman alumni and the university are worthy of support. Following the luncheon, donors and members of the Newman Student Alumni Board met in the Tarcisia Roths, ASC Alumni Center for an informal “Meet and Greet,” which allowed more time for conversation among scholarship sponsors and student recipients. The Newman University Sloppy Joes Improv Troupe also performed.